The Adverse Childhood Experiences study found that people who had experiences difficult or adverse experiences in childhood had a greater risk of both physical and mental health problems during adulthood. The risk increases significantly for people with larger numbers of adverse experiences in their childhood. Adverse experiences include not only trauma and abuse, but also non-traumatic stressors like parental divorce and household dysfunction., . There are 10 questions, each is answered by selecting Yes or No. These questions are in English have been designed for adults (age 18 and older). Warning: These questions may cause distress. Some questions ask directly about experiences of child abuse. Check that you have a support person or helpline number available before beginning. Download a printable version (external link) of the ACE questionnaire. Press Calculate Result to see your score. Questions 1-3 refer to emotional, physical and sexual abuse. Questions 4 and 5 assess emotional and physical neglect, and questions 6-10 refer to household dysfunction. 1. Centers for Disease Control and Prevention, National Center for Injury Prevention and Control, Division of Violence Prevention. (2014, May 13). About the Study. Retrieved June 27, 2015. 2. Centers for Disease Control and Prevention, National Center for Injury Prevention and Control, Division of Violence Prevention. (2014, May 13). Prevalence of Individual Adverse Childhood Experiences. Retrieved June 27, 2015. 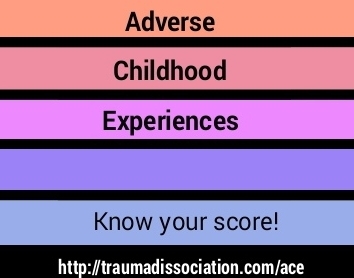 Adverse Childhood Experiences Questionnaire Traumadissociation.com. Retrieved from .